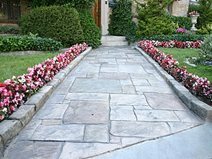 Textured concrete finishes are going to be the least expensive of the decorative concrete ideas listed here. The reason is because all these finishes are done by the concrete finisher, or maybe one or two extra finishers on the crew. They require no added materials to produce (except for several bags of salt in the rock salt finish application). 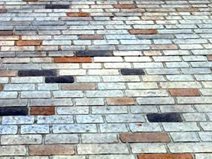 Stamped concrete, commonly referred to as textured or imprinted concrete, is concrete that is designed to resemble brick, slate, flagstone, stone, tile and even wood. 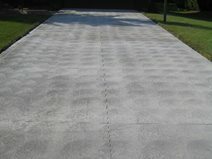 Stenciling concrete can be a great alternative to decorative stamping while permitting similar design flexibility. Patterns can be made on the concrete, such as swirls, or different size arcs. The texture created can be coarse, medium, or smooth depending on the tool used to impart the pattern. Wood floats create coarser textures. Aluminum floats or steel trowels create medium or smooth finishes. 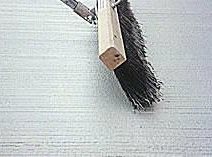 Broom finishes can be light broom or coarse depending on the bristles of the broom you choose. This is not a fancy finish but provides a non-slip surface. 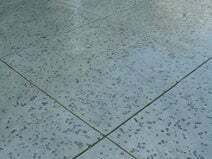 Water softener salt crystals 1/8" to 3/8" in size are broadcast onto the fresh concrete. A roller is then used to press the salt crystals into the concrete. The surface is later washed, dissolving the salt and leaving small holes. Read more about rock salt finishes.